Another memo (from even earlier in the planning process) finds researchers at the BBC doing a survey of sci-fi literature to discover what sorts of stories might be suitable for the new program. They list the BBC’s requirements that the stories feature: 1) no “bug-eyed monsters;” 2) no “tin robots;” and 3) no “elaborate science fiction type settings” like spaceships and planets. Of course, this didn’t last long: the second-ever Doctor Who story, “The Daleks,” broke rules 2 and 3 by introducing the titular “tin robots” and their planet, and the Daleks proved so popular that the BBC’s reservations about “science fiction angles” quickly went away. 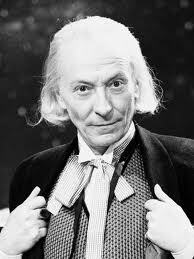 Still, the first few seasons of Doctor Who featured many stories that had no sci-fi elements except for the TARDIS itself: these so-called “historicals” are purely human dramas that take place during various time periods—the height of the Aztec empire, the Crusades, the French revolution, et cetera—with nary a bug-eyed monster or tin robot in sight. (Though one Fifth Doctor story—1982’s “Black Orchid”—qualifies as a pure historical, the show otherwise abandoned such stories and fully committed to science fiction during the Second Doctor’s reign, after 1967’s “The Highlanders.”) There’s nothing wrong with the historicals—in fact, it would be interesting to see new Who attempt one—but let’s face it: robots, monsters, and alien landscapes are simply more fun. It’s a strange thing to realize, but 21st century Doctor Who doesn’t actually do this sort of thing as much as it did in the classic era: one would think the show’s technology and budgets now would be more conducive to the creation of alien worlds, but it’s actually become a very rare occurrence for us to roam an alien planet the way Doctors 1-7 frequently did. 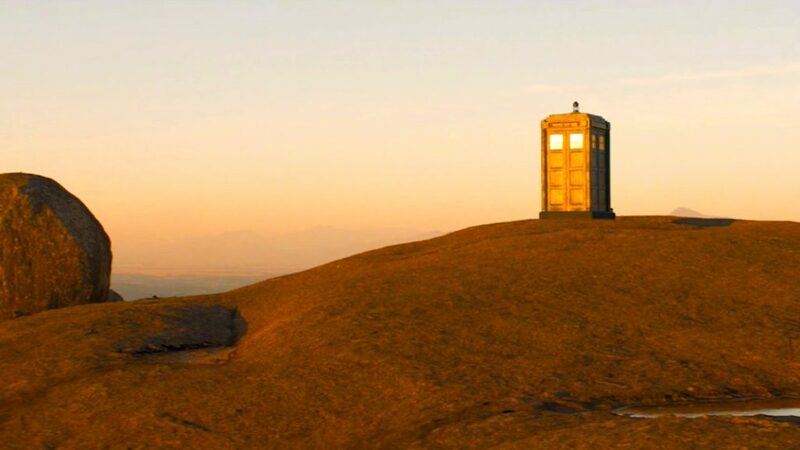 (In the Moffat era, a few stories have taken place on other worlds, but we haven’t really seen an alien culture. 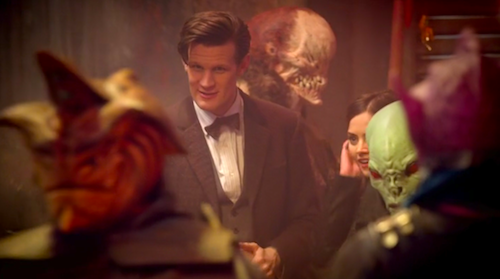 The closest is probably the subterranean colony of Silurians in “Cold Blood,” and—closer to the tone and purpose of this episode—the futuristic human civilization in Amy Pond’s second outing, “The Beast Below.”) Creating slightly dodgy-looking alien worlds in BBC studios was such a clunky, endearing signature of the classic series, one suspects that modern Who has consciously stayed away from it, but it was refreshing to see the production team do it here. In fact, “The Rings of Akhaten” felt more like classic Who than any episode in a long time. For one thing—though the explanation for the story was kind of complicated—the story itself was remarkably straightforward and uncrowded; particularly after last week’s silly hour of Short Attention Span Theater, the way this one patiently unfolded—seriously, and without a lot of extraneous nonsense—was a blessing. And it wasn’t just the pacing of the episode that was more mature and less frantic: the same can also be said of the Doctor. I do generally adore the childlike hyperactivity of Matt Smith’s Doctor, but it can wear a bit thin at times, and I like the calmer approach to the character Neil Cross takes here: the Doctor is still wonderfully eccentric, but he is also capable of behaving like a grown-up for full minutes at a time. And—on a related note—it was a pleasure to hear an acknowledgement that the Doctor is a grandfather: we hear frequent references to the Doctor’s age, and Matt Smith is particularly adept at channeling the old man within the boyish-looking Time Lord, but it’s rare (and very welcome) to get an explicit reference to the fact that the youngest version of the Doctor ever to grace our screens was a white-haired old man. And none of this, of course, is a coincidence: it wouldn’t be one of my reviews if I didn’t drone on about the thematic subtext of each episode, and so here I’ll say that it’s impossible to ignore the fact that this reference to the Doctor as a grandfather comes in an episode where the main threat—the Old God itself—is also called “Grandfather.” When I wrote about this season’s “The Snowmen,” I discussed how the threat of that episode—the snow—was a metaphor for the Doctor himself; is the same thing going on this episode? Will this be a running theme in our 50th anniversary season? “The Rings of Akhaten” doesn’t hit these notes overtly, but we don’t have to stretch very far to see the subtext at work. Grandfather—revered as an ancient god—turns out to be a parasite, a vampire, one who requires a steady diet of young girls to sustain him: Merry (Emilia Jones) is simply the latest in a long line of girls called “The Queen of Years,” who sing their song to soothe Grandfather, and are occasionally sacrificed to his service. 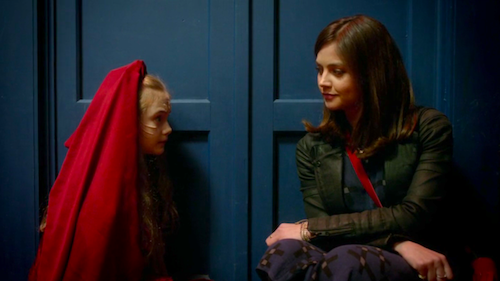 It’s hard not to see the parallels between her and Clara, who is the latest in a long line of young girls who comfort Grandfather Doctor, and are occasionally sacrificed in the process. The notion that the residents of Akhaten use stories as currency is a lovely one: they trade in objects with sentimental value, which is to say objects to which stories have been attached. But the giant, world destroying gas giant Grandfather also lives on stories—or souls, which, as the Doctor says, amounts to the same thing—and there the parallels between Grandfather and the Doctor become more troubling. One of the things I love about Doctor Who is that a scene like this can be a happy ending on the surface, and yet resonate in ways that are at best bittersweet, and are perhaps even tragic. Clara earns her companion stripes here—as Amy did in “The Beast Below” and “Victory of the Daleks,” by bringing the humanity the Doctor couldn’t provide—but there is something dark and troubling in watching the Parasite God consume this treasured memento that represents both Clara’s memories and her potential for a normal life. 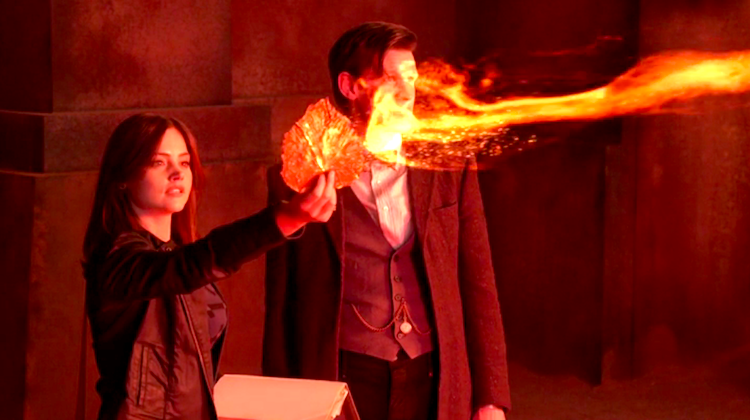 Companions often end up sacrificing their lives—literally or figuratively—to the Doctor, and in fact some version of Clara has already done so twice. This is the triumphant moment when Clara truly becomes a companion, but Moffat and Cross recognize the double-edge of that: for this is also the moment that she chooses Doctor-life over normal life, and thus seals whatever fate awaits her. Now, having argued that “The Rings of Akhaten” is a much darker and more depressing episode than it might first appear to be, I want to offer another, slightly more amusing alternate reading: “Grandfather” doesn’t symbolize the Doctor, but the program Doctor Who. Bear with me: the show is this ancient, unstopppable force with an endless appetite for stories. It is serviced by an eternal line of priest-like “choristers,” each one taking over where the other left off, creating a long, unbroken legacy of song. 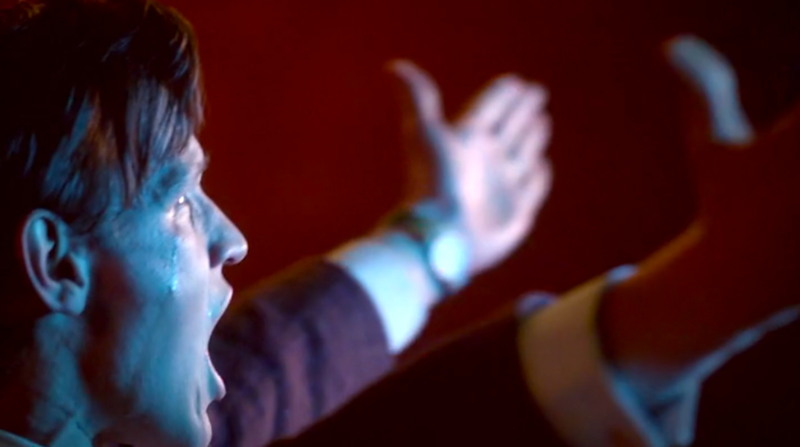 In this metaphor, Steven Moffat and his crew are the current choristers, taking their turn at the altar, offering stories and history, sentiment and nostalgia. 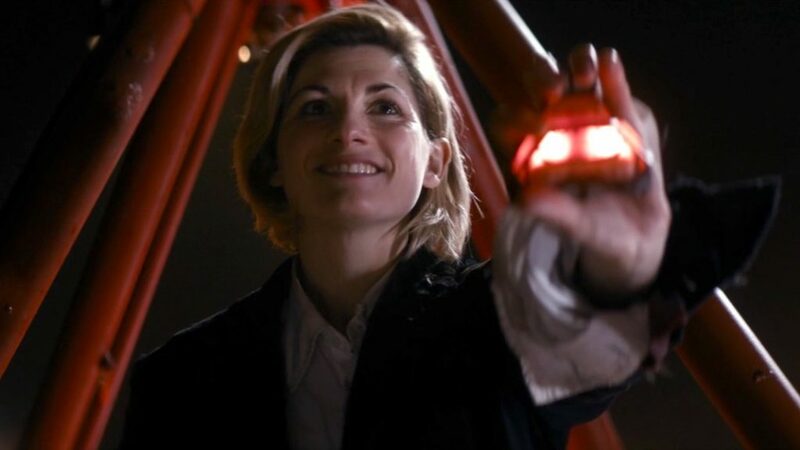 Here, the Queen of Years still represents the character of the Doctor’s companion, for the show requires new blood every once in a while, a new young woman to take over for the previous one: she will learn all the show’s poems and legends and songs, and she will add her voice to the chorus for a while, but she will ultimately be sacrificed. The girl changes, and the priests change, but the show itself goes endlessly on. And here is where we come back to where I began, for what really made me start thinking about classic Who and the old historical stories is that distinction “The Rings of Akhaten” makes between history and invention. “There’s quite a difference between what was, and what could have been,” the Doctor says. 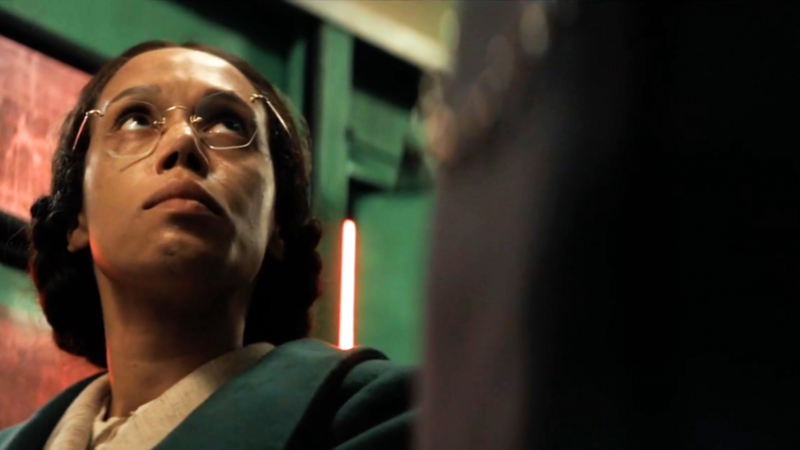 “There’s an awful lot of one, but there’s an infinity of the other.” It’s a distinction the show made, a long time ago, in deciding to embrace the endless possibilities of science fiction and fantasy over the limited possibilities of history and fact. Doctor Who is a show steeped in history—both its own, and the history of the world—but what really matters is the stories untold, the untapped potential of invention. In this anniversary year, it’s a nice message: there have been an awful lot of stories told, but there’s an infinity of stories yet to be come. It’s a story that echoes where we began this episode, with the leaf, and Clara’s father describing the sequence of miraculous events that all had to happen just so for he and Clara’s mother to meet. And it’s a story that Clara unconsciously echoes at the end, when the Doctor tells her she reminds him of someone else. He means, of course, the other two Ms. Oswalds that he has met, and lost, already this season: the one in the future, at the Asylum of the Daleks, and the one in the past, who battled The Snowmen. But his comment also evokes the fact that Clara is another in a long line of companions, just the latest young girl who travels with the Doctor, the latest expression of a narrative pattern etched deeply and permanently into the structure of this show. But Clara won’t have it: part of the pattern is that every companion must earn her stripes, and stake her claim, and make it clear that she is different from all the others, with her own unique stories to tell, her own infinite possibilities to explore. “Whoever she was, I’m not her.” Clara says, “If you want me to travel with you that’s fine, but as me. I’m not a bargain-basement stand-in for someone else.” History is important, but this is a new beginning—her beginning—and the possibilities are endless. In choosing to blather on about some of my favorite hobby-horses, I’ve skipped over the more obvious theme of religion present in this episode—one made more explicit by the double-pun of naming the Queen of Years “Merry”—but I enjoyed it from that perspective as well. This, too, is very much like old school Who: a Doctor who drops down from the stars, exposes false gods, and destroys the false belief system of an entire civilization. 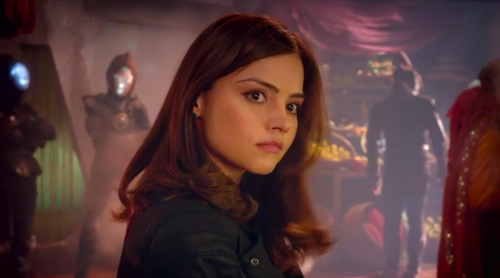 Why do I suspect that Clara’s mother is going to turn out to be very important to her mystery? And I have a crazy theory—based more on how I suspect Moffat’s mind works than anything in the text—that this is all somehow going to circle back around to Susan, the Doctor’s granddaughter and first companion, who left him to get married in a 1964 episode. After her mention in this episode, it occurred to me that nothing would be more Moffat, in this 50th year, than to bring us full circle back to where Doctor Who began. It’s a minor complaint, but I do so wish they wouldn’t try to do stuff like the Doctor and Clara flying through space on a moped (or the Doctor riding a motorcycle up a building last week). It never looks good, and we don’t really want the Doctor to be that kind of action hero anyway, do we? Random observation: I don’t think this has any particular meaning, but someone (besides me and my girlfriend) clearly watched Blade Runner recently. 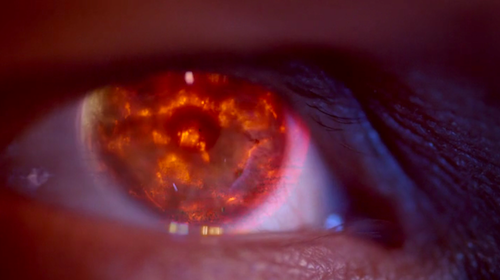 I counted three different references to it, which is at least one too many for it to be a coincidence: the Doctor’s line in his monologue about “I’ve seen things you wouldn’t believe”; the Doctor’s recitation of “Home again, home again, jiggity jig”; and a super tight close-up of flames reflected in Clara’s eye. Apologies, as always, for the delay in posting this week: a perfect storm of technical issues, illness, work demands, and basic, bone-idle procrastination has set me severely behind schedule lately. I hope to catch up soon. When I watched the episode, I really could not get so much of what all the speeches’ suppose to mean, they were just sad and wonderful words. It is only after reading this that all these metaphors come to me and make perfect beautiful sense. The story-longing creature is the Doctor, and also us… The stories are offered by every single new companion, and also the show itself…. I always thought the reason why we, us, the audiences, would be so drawn into Doctor Who is the nature that we crave for an endless supply of stories, to feed our minds and imagination and feelings. But one thing that really bothered me during the scene is that: aren’t the Doctor supposed to have lost his memory after offering them all to the god? I was waiting, but it’s back again. There’s also a kind of curious moment in which Merry and all of the assembled aliens sing to “Grandfather,” and assume that they are calming? addressing? him, while in reality, he is glutted on Clara’s leaf and future. It’s a strange assumption of power and connection on their part, when in reality their actions aren’t all that significant except to the Doctor as metaphor (doesn’t he refer to them at some point as he excoriates Grandfather for his appetites?). I wonder how that might fit your layered model of allusion here. Girls who believe they are having an effect, when really it’s the sacrifice of another that’s occurring? Likewise, a vast and diverse audience who believes that it is contributing to a common cause, participating in a moving event, and yet is unaware of what’s really making a difference?